iBurst Africa, a telecommunications business controlled by iBurst executive chairman Thami Mtshali, wants to raise as much as US$200m in funding as it pursues broadband opportunities across the African continent, including Nigeria. However, plans to reverse list into a cash shell on the JSE have been set back by at least two months. This is as a result of delays in auditing iBurst Africa’s books. “We are definitely going ahead with the reverse listing and it will happen by the end of November,” Mtshali says. He says the company has decided to reverse into a cash shell, rather than pursue a new listing, because of the shareholder spread the shell offers — it has more than 2 000 shareholders. The cash shell is on the main board of the JSE, but there is a possibility that iBurst Africa could move it to the AltX. “We haven’t decided that yet,” Mtshali says. iBurst Africa hopes to raise most of the funding it needs via the listing. But it is also pursuing debt financing through the Industrial Development Corp (IDC) and the Development Bank of Southern Africa (DBSA). It has approached both institutions for funding. The IDC and DBSA, which have already provided iBurst Africa with $31,5m in debt financing, should make a decision on whether they’ll provide further funding soon, Mtshali says. iBurst Africa has already spent the $31,5m — the IDC and DBSA each provided 50% of this money — building networks. iBurst Africa has raised an additional $5m from banks in Ghana and another $1m from other African banks. Though Mtshali owns a significant chunk of iBurst in SA, iBurst Africa is not directly linked to the SA business. Mtshali’s Galela Telecommunications, a trust company, holds 80% of iBurst Africa whereas iBurst SA’s parent, Wireless Business Solutions, has a diverse range of shareholders, including Vodacom, Blue Label Telecoms founders Mark and Bretty Levy, the Ellerine Bros and Galela Telcoms (through Richtrau). iBurst Africa will publish a prospectus in October, Mtshali says. He blames the listing delay – the reverse listing was originally slated to happen around now – on the need for iBurst Africa’s auditors to review the results of each of its four operations, namely Ghana, the Democratic Republic of Congo (DRC), Mozambique and Kenya. 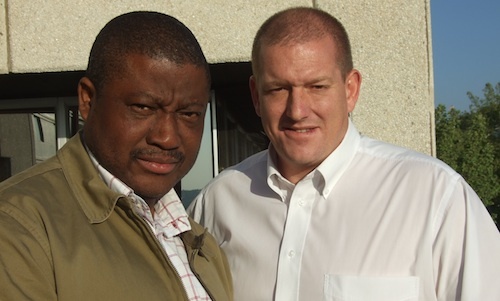 iBurst Africa recently secured licences to build networks in Cote d’Ivoire in West Africa and in Namibia. But it’s the Nigeria market, where the company will soon be granted a chunk of radio frequency spectrum, which has Mtshali most excited. He wants to spend $50m there building a wireless broadband network using the proprietary iBurst technology. He says iBurst Africa has already drawn up a detailed roll-out plan. Though Mtshali wants to raise $200m in total to expand in key African markets, he says iBurst Africa does not need all this cash up-front. He says he is acutely aware of the tough economic environment and that he is listing the business in arguably the worst economic conditions in a generation. Coupled with this, iBurst Africa has to compete with cellular network operators such as MTN, Vodacom and Zain – companies with far greater financial muscle. But Mtshali says there are a number of factors counting in iBurst Africa’s favour: its operating licences don’t cost as much as the cellphone operators’ licences and the technology it uses is ultimately cheaper to deploy and run than the 3G systems used by the mobile companies. Margins for broadband elsewhere in Africa are also very good, says iBurst Africa CEO Leon de Fleuriot. In some markets, such as the DRC, there is very little by way of infrastructure and competition so profit margins are exceptionally good. iBurst Africa has signed up more than 3 000 high-paying subscribers in the DRC; in Ghana, it has nearly 10 000 subscribers, but margins are lower. “Margins in the DRC are three times higher than they are in Ghana,” De Fleuriot says. Mtshali says that initially investors won’t be buying into iBurst Africa based on its earnings, but on its long-term growth potential. And he thinks demand for broadband will outstrip expectations, much as demand for cellphones on the continent caught everyone off-guard. iBurst should improve its customer relations and operations in SA first before they set off for other lands… a LOT of people currently is very upset with the status quo. If you read the article carefully you will see that iBurst Africa and iBurst SA are 2 totally different operations.